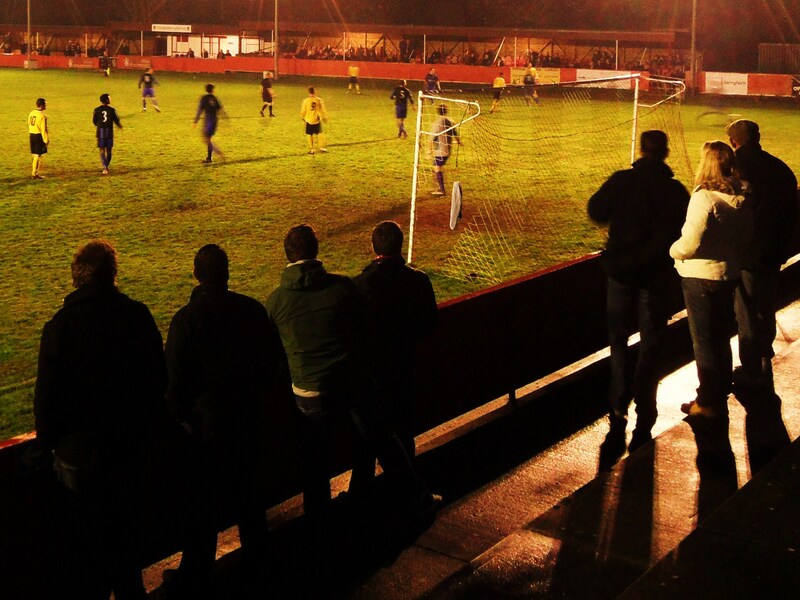 About the Culverden Stadium Culverden Stadium is a well-maintained ground, aided by a supportive local council, and tucked away at the end of a long approach road behind the Kent & Sussex Hospital. New concrete terracing has been laid behind the near goal, replacing a more shallow version that originally extended a bit further around behind the corner flags. There is a large car park and a new clubhouse; with the whole ground enclosed by a perimeter rail filled in by advertising boards. Two metal cladded, and rather undistinguished dugouts stand on the west side of the ground. One would have preferred a couple of red and white painted brick versions but you can’t have everything, and at least they blend reasonably well with the trees behind. In any case, the main interest lies on the opposite touchline and the main stand. The pitch slopes downwards towards the far end, where it drops away sharply behind the goal. The slope of the pitch is underlined by the staggered roofing of the original committee facilities and original clubhouse/changing rooms that stands on the half-way line, and the two covered stands (added later) on either side, of brick and wooden construction. Combined, these extend virtually the whole length of the eastern touchline and, although they are not especially elevated, they do nevertheless give the stadium its main definition. How to get to the Culverden Stadium The ground is accessed via a long country lane that runs off Culverden Down. From the A26 (from Tonbridge) you need to turn right into Culverden Down from St Johns Road immediately after you pass Skinners School on your left, opposite The Lava Bar and Restaurant. Follow this road for awhile, over some speed humps and then as the road bends around to the left, the entrance to the ground is on the right. Parking is free at the ground. If you are coming from South along the A26 (from Lewes), go up the hill through the town centre and straight over roundabout. Take the first left after the site of the old hospital and then left into Culverden Park. Follow this for about 3/4 mile and then eventually left into the road for the ground. The nearest station is Tunbridge Wells which is a twenty minutes walk away – probably best to get a taxi. Admission to the Culverden Stadium Adult admission is £6, Concessions £3 and under 12’s are free. Programmes (£1.50) are available on the gate.